Registration is now open for our upcoming workshop, Utility Box Murals. This session will introduce the StART Outside the Box and Bell Box Murals programs, review the application processes, and discuss effective design and painting strategies for utility boxes. This workshop is part of the WALS: Behind the Scenes workshop series. Click here to view the full series. What: Do you want to liven up the streets with a utility box mural? Not sure where to start? 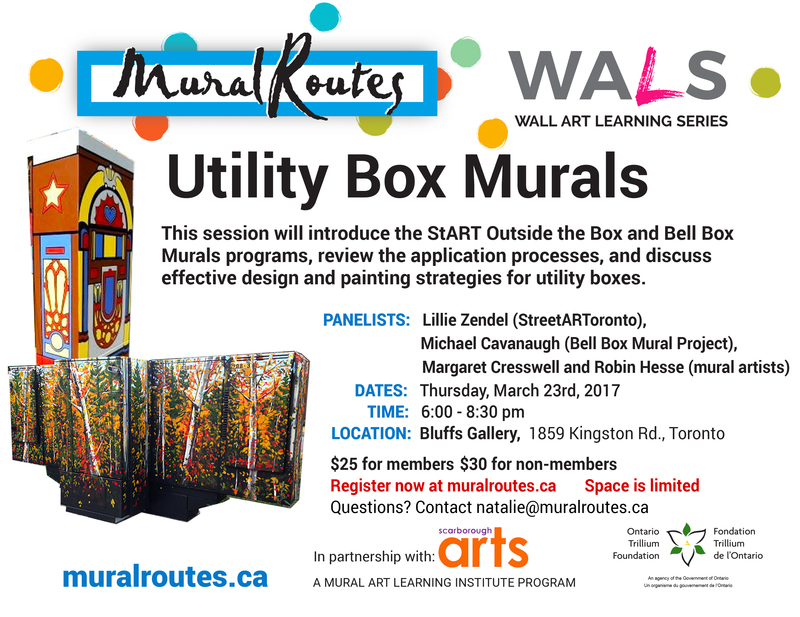 This session will introduce the StART Outside the Box and Bell Box Murals programs, review the application processes, and discuss effective design and painting strategies for utility boxes. Registration: $25 for Mural Routes members or Scarborough Arts members, $30 for non-members. Includes light refreshments. Register below. Contact natalie@muralroutes.ca with any questions. This workshop is being held in partnership with Scarborough Arts. The Wall Art Learning Series is part of the Mural Art Learning Institute (MURALI), a continuum of training programs in all aspects of mural-making. MURALI is generously supported by the Ontario Trillium Foundation. Flyer images by Robin Hesse (top) and Margaret Cresswell (bottom), 2016.